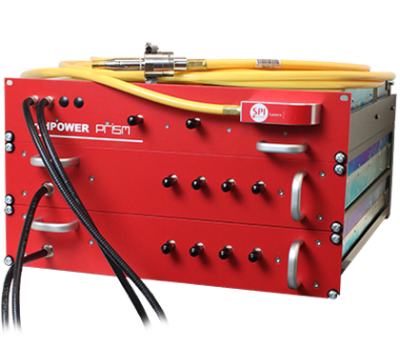 redPOWER® PRISM Multi kW OEM high power Fiber Laser modules, are based on the latest generation Fiber Laser platform, and designed to give system integrators flexibility when incorporating single or multiple units into an industrial Laser processing system. Download the product data sheet, including full specifications, features and industry suitability. redPOWER® PRISM Multi kW OEM core products comprise a 1.5kW unit and a multi-port High Power Combiner (HPC) unit. Multi-kW Lasers can be built by combining multiple 1.5kW units with an HPC unit. A single output fiber from the HPC delivers power to the process tool. As well as containing high power fused components, the HPC also contains a Laser control and interface card. The system integrator adds value to these basic units by providing the DC Supply, a suitable enclosure, a controlled coolant supply and system level safety control. For this latter function we are able to assist with an optional Beam Delivery Interlock Unit (as described below). The complete range of units are designed to mount into an industry standard 19” rack mount, giving a consistent look to the final Laser, and facilitating ease of enclosure sourcing. Each 1.5kW module is in a 3U rack mount case with a single mode output bare ended Fiber allowing straight forward splicing onto the High Power Combiner input port. Combining multiple modules together, allows the system integrator a flexible approach in choosing the desired multi-kW Laser source in logical power steps. An on-board protection unit provides low level safety and integrity monitoring, plus shut down when required, and interfaces with Fiber Laser control (in the HPC tray). The High Power Combiner unit allows up to four (4) Fiber Laser Modules (FLM) to be combined together into a single beam delivery fiber. The HPC unit is designed to allow ease of access to the splice points for joining the individual single mode fibers from each Fiber Laser module onto the multi-way fused fiber combiner. These can be accessed with the HPC still mounted into its rack support cabinet. The HPC Unit contains our standard Fiber Laser Control Card. This gives all the benefits of multiple control interfaces, integrated pulse generator, and the ability to use our comprehensive and flexible FiberView GUI control software. An optional visible pointing diode is available, providing a red beam from the main delivery Fiber to indicate the Laser working position. The delivery fibers use our patented Plug In Pre- Aligned (PIPA) ‘Luminator’TM termination with integrated Back Reflection protection for direct use in a range of process tools. The delivery fibers feature antireflection (AR) coated output faces for maximum transmission of Laser power to the workpiece, and are available with 50μm or 100μm core diameters and a range of fiber lengths. The Beam Delivery Interlock Unit is offered as an option to help system builders with integrating the Laser source into the system level safety control architecture.